Twenty-six chapters, one for each letter of the alphabet, chronicle Candice’s efforts to fix her family, her friend—and even her fish. Candice Phee’s family is a mess. Her baby sister is dead, her mom has had a double mastectomy and is depressed, and her father has quarreled with Rich Uncle Brian. Others in the 12-year-old’s life also need help, from her teacher, who has a lazy eye, to her only friend, Douglas Benson from Another Dimension, who is convinced that his parents are facsimiles. Even her pet, Earth-Pig Fish, is religiously confused. Candice, who likes everyone although she knows no one likes her, is somewhere on the autism spectrum (her pencils and pens cannot touch) and is literal to a fault, painfully honest and on a mission to make everyone happy. Award-winning Australian author Jonsburg captures quirky, irrepressible Candice’s voice in this first-person narrative that is as touching as it is funny. 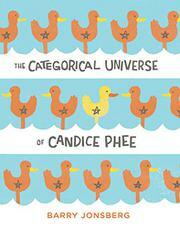 The humor stems from both Candice’s rigid literalness and her well-intentioned but often bungled efforts to fix things.